A combination of whole Maitake mushroom powder and standardized active glycoprotein in a capsule form. This product is suitable for regular health maintenance support for healthy people. 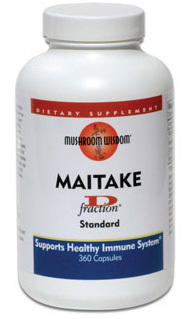 * For other purposes Maitake D-Fraction® Professional Strength is recommended. As a dietary supplement, take 2 capsules twice a day between meals or as directed by your practitioner.